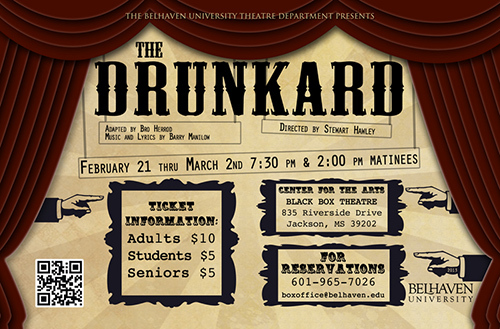 February 15, 2013 (Jackson) - The Drunkard is a musical that will debut February 21  March 2 at 7:30 p.m. in the Belhaven Blackbox Theatre. The musical, presented by the Belhaven Theatre Department, is based on the 19th century, world-famous melodrama by W.H.S. Smith and will feature music and lyrics by Barry Manilow. Saturday matinees on February 23 and March 2 are available and will start at 2:00 p.m.
We're excited about this show because we get to jump back in time a bit and explore the world of vaudeville style performance, the broadness of melodrama and the variety of musical interludes and comedy bits all within one show. It's been a lot of fun in rehearsal and we can't wait to share it with audiences, said Joseph Frost, Associate Professor of Theatre. Call 601-965-7026 or email boxoffice@belhaven.edu for reservations. General admission is $10 to the public, $5 for students and seniors. There is complimentary admission for Belhaven faculty, staff and students. Belhaven University stands among select Christian colleges and universities and has been repeatedly named one of Americas 100 Best College Buys." The University offers 30 academic majors across a full spectrum of disciplines as well as a variety of graduate programs. In addition, Belhaven has achieved the distinction of being among only 30 universities nationally accredited in each of the major arts  music, theatre, visual art and dance. All programs are taught from a Christian worldview perspective and are guided by the mission to prepare students academically and spiritually to serve Christ Jesus in their careers, in human relationships, and in the world of ideas. Belhaven University serves over 3,700 students offering undergraduate and graduate degrees on its residential campus, an online degree program, and graduate and adult degree programs in Jackson, Memphis, Orlando, Houston, Chattanooga, and Atlanta. For more breaking news, announcements, and upcoming events, visit the Belhaven University News and Information web site.